Moving on to the low-level compute guts of the cards, we take a look at compute and synthetic results starting with tensor core accelerated GEMM. While using binaries compiled for Volta, Turing is backwards compatible in that respect as it is in the same compute capability family (sm_75 compared to Volta's sm_70). In terms of compute resources, the RTX 2080 Ti's 544 tensor cores and 1545MHz boost clock is not far off of the Titan V's 640 tensor cores and 1455MHz boost clock, so the latest Turing-optimized binaries should better reflect the RTX 2080 Ti's raw GEMM acceleration capabilities. 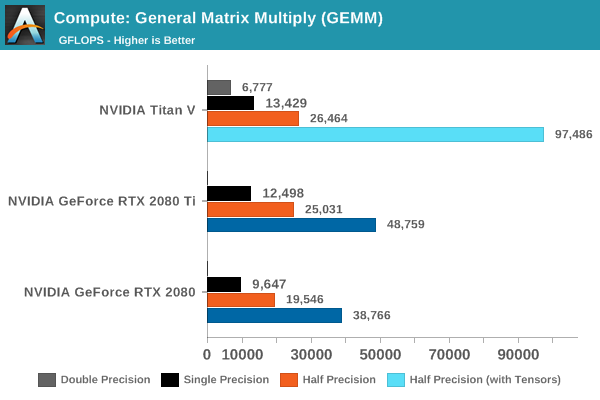 Likewise for the 368 tensor core RTX 2080, whose tensor-accelerated HGEMM performance in TFLOPS is somewhere around 20% less than the RTX 2080 Ti.